To my friends who are changing lanes. You know who you are! I wish you the best of luck and salute your courage. It can be pretty scary sometimes changing lanes on the freeway, or any busy road. Here we are, hurtling along at 60, 70 or 80 miles per hour, protected only by thin pieces of metal – and now we have to speed up or slow down and look around 360 degrees for the other hurtling objects, gauging the best instant to make the move. Thankfully I’m not thinking this every time I drive or I’d never go anywhere. Like many, I listen to music and go with the flow on auto pilot. I usually stick to the middle lanes, midway between the fast and the slow. The only time I drove 90 miles per hour in the express lane a family member was on his deathbed and the only time I stayed at 40 mph in the slow lane I was stuck in second gear in my old sports car. Yes, the middle lanes have suited me, both on the road and in life. I don’t like to hurry or multi-task and am more of a Type B than a Type A fast track person. The three years I spent working full-time, finishing college and caring for my two sons were the closest I came to the fast track and I was glad when they were behind me. However, I do like to move along, reach real or imagined destinations, and in the middle lanes I can avoid running into those slow lane putt putts making tentative entrances or looking for exits. But recently the slow lane has started to appeal to me. Since leaving my demanding technical writing job three years ago and working as a freelancer, I haven’t had to work as much, and more important, I haven’t wanted to work as much. Gradually, I’ve been drifting from the next-to-the-fast middle lane to the next-to-the-slow middle lane – and I’m starting to eye those exits from the slow lane perspective. Maybe I’d like to get off the freeway altogether and explore the coast highways and byways? Maybe it’s time to find other ways to work, in addition to or in place of writing for a living, writing what other people want? Maybe I could join the artists and explorers who are taking the time to feel the ground underneath their feet and smell the ocean, desert, and mountain air? Maybe reaching external destinations is no longer required, at least not all the time? And so, here I am, easing into the slow lane, edging back into the middle. Riding between the lanes like a motorcyclist and just as exposed. Recently I pulled off for a couple of hours and visited an old friend. A year ago she left her high-powered marketing job and immediately enrolled in culinary school with the idea of becoming a chef. For several months, she stuck to a grueling schedule. When she finished, she realized she didn’t want to be a chef at all – a least not professionally. She loves to cook for friends and family, but she didn’t want to work for anyone! So, in addition to exploring famer’s markets, she adopted a dog, rescued from the streets, who gets along well with her cats, and requires a lot of walking. She also tends a couple of rose gardens in a public park. She gave me a tour, naming each rose bush and explaining its history. “I’m loving all this, but I wonder if it’s really enough?” she said. We laughed and laughed at her dog’s antics. With broken legs in his past, he hates getting in and out of the car. With a tender back, she hates the wrestling match it requires to get him to move. Once back at her place, she clipped me some red roses from her own garden. I got back on the road and headed home, in the slow lane. 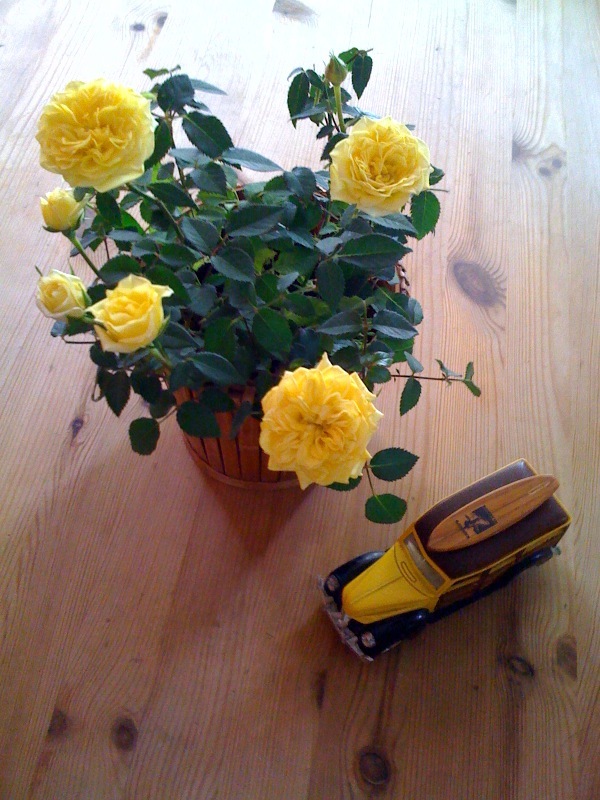 The smell of the roses filled my living room for many slower-paced days. It felt like more than enough to me.